Sirron Norris is an educator who has been working with Bay Area youth since 2002. He’s better known as an artist reconfiguring cartoon cliches into animistic cityscapes that are edgy, corrupt. (But fun as hell.) 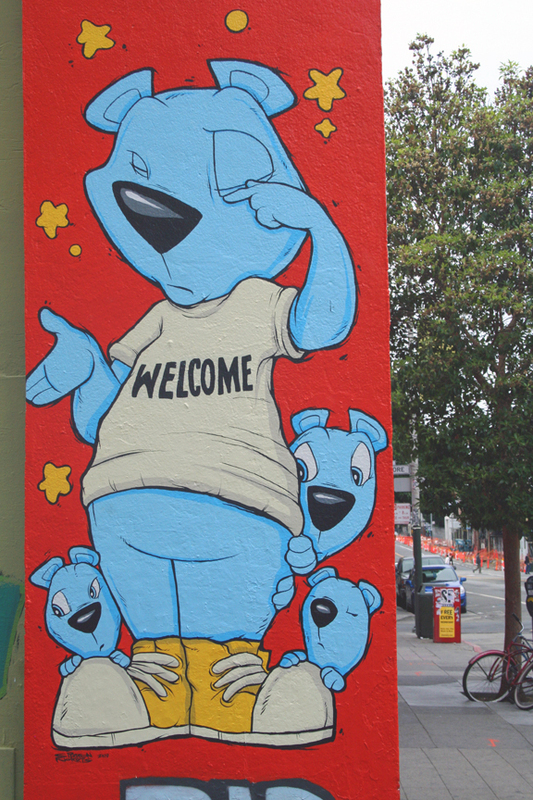 His murals can be seen at Balmy Alley, Clarion Alley, Jay’s Cheesesteak… you know the places, just follow the blue bear tracks. After living in the Mission District for six years, Norris moved to Glen Park. Now he’s back for business with a new studio gallery at 1406 B Valencia St. where — among many things and things yet to be seen — he’ll be teaching the art of cartooning. Mission Loc@l: You’ve stopped painting murals and given up the gallery/museum lifestyle. It seems now you’re immersed in community in a more direct way with your new space and continuing work in arts education. How has it been so far? Sirron Norris: It’s been great! To be honest my intention was to just share. I’m a loud talker and really opinionated, and I believed there was something fundamentally wrong about how art is distributed to the people. I just took the pathology of how people look at art informally on the streets and brought that philosophy into my space. Not till after I opened did I realize the potential impact I can have in my community and especially with youth. I just wanted to let everyone know that I might have a lot to say, but I walk my talk and all I can do is try to do what I envision as an art career that gives rather then takes. 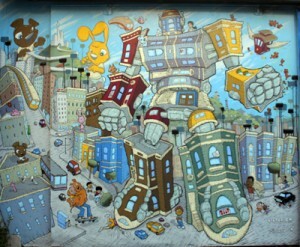 From mural "Victorion Defender of the Mission"
ML: I really appreciate how your new studio gallery is family friendly. There’s attention to details for kid appeal in the art, merchandise and design. Did you consult a young’un or was it all your inner child? SR: It was all my inner child — that’s actually my specialty — ask my wife! I never expected the kids. That’s what blew me away about the opening. How many gallery openings have that many kids? So special to be surprised like that and what a great direction to focus on. We will be having summer animation camp. We will also start putting together birthday party packages here at the gallery and of course our cartoon classes start this weekend. We are very excited to get that ball rolling with exposing and entertaining kids with art. ML: What do you hope students will gain from your cartooning classes? SN: I would like them to gain confidence in their creativity. Let’s be realistic — most are not going to turn this into a career. But what it will do is give them experience creating. Creating breeds ownership and ownership is pride. Art has its hands in all our self development. ML: This neighborhood is a visually stimulating place to raise kids. My 16 month-old already has his favorite murals. 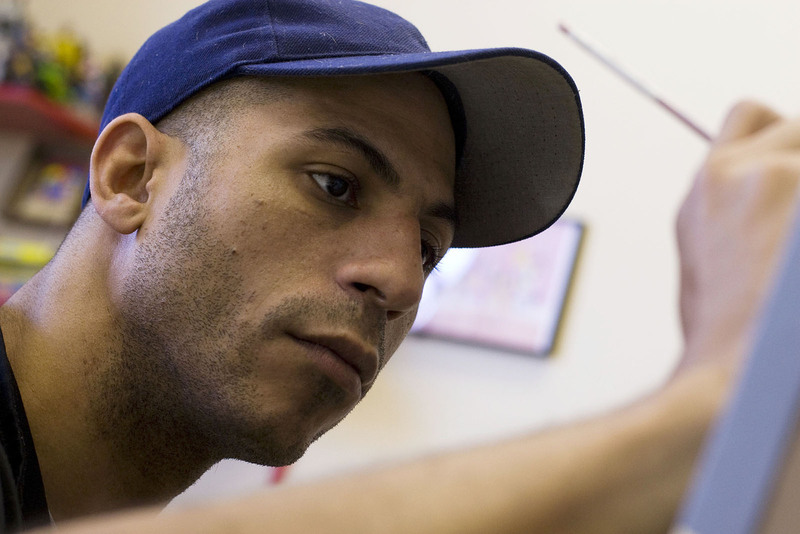 Where’s the next generation moving to with street art and expression? SN: Interesting question. I think at this point it’s clear that the Mission and it’s history of figurative dramatic hand brushed murals is slowly fading into legal graffiti pieces. I actually think that’s where murals in the Mission are evolving to. I feel two ways about this. On one hand, I’m sad because graffiti always has tagging attached to it and I only see that as destructive. And then on the converse, I think youth today and especially smaller kids don’t respond to traditional mural aesthetics anymore. So in order for them to respond and learn of our history etc. we need to speak in their language. It’s hard to compete with images of SpongeBob. ML: You have a recognizable style. Do you sometimes create works that people wouldn’t recognize? SN: No, more the opposite — people claim I have done more stuff then I really have. Everybody paints SF city scenes in murals and sometimes they look like my stuff. ML: What cartoons influenced your style? SN: My most influential cartoons are anything from Hanna-Barbera. I love the style of those characters and they always make me feel close to my childhood. ML: Why are you returning to gaming? SN: Well, I have been going back to my roots over the past couple of years. I’m actually putting down that hat for the moment to concentrate on my gallery. I love games and I’m interested in gaming as an art form. I’m always going to continue to explore it as a vehicle for my art. My game in my gallery is just a start at elevating painting and fine art into the digital age. ML: What’s your favorite game? SN: Right now it’s embarrassingly “CALL OF DUTY”. I have no time to play, but super late at night. It’s just plain fun and I love the mini senses of accomplishments the game gives me. ML: What do you think about violent video games? SN: That’s the golden question when it comes to gaming. Interestingly, the video games genius was born out of violence. It’s essentially a violent medium from the beginning. When they invented video games, it took far less processing power to just cancel an object out then recreate another object on screen. So games back then (which were running on really small computers) found it way easier to have a game that is all about taking something away — or killing (Asteroids, Pac-man). To answer your question, I think games are out of control in terms of violence. But I also think that they make games for older people now — before that wasn’t the case. So it goes back to responsibility of parents, etc. This isn’t the old days where cartoons and games are just for kids. Now of course this doesn’t include how marketing is unfair in how they play into demographics. But that’s another big discussion. ML: In your Bay Area Video Coalition interview you talked about the idea of video game creation being a metaphor for life. How does the 3D interactive video game in your studio parallel your own life? SN: Hmmm, I guess the game that we create in my BAVC class [3D animation and video game production for teens] has curriculum attached to it — along with mission statements of one non profit and the NSF [National Science Foundation]. So that’s just how I applied it in a class setting — [designing a labyrinth game with objectives of] future career, goals, etc. My game in my studio is just another example of branding. I have attached my art to everyday objects and I thought a video game would further push this idea of DIY branding — I see it as the future for artists. The internet has allowed writers to be published with esteem; they have a resource that allows them global distribution. What do painters do? We know paintings don’t sell over the net. So how can artists jump on the train of a wired economy? ML: What do you think about copyright and digital art? SN: I think it’s important to protect your art — everyone’s ideas should be left for only them to profit. Copyright in digital art is pretty pointless. Your only recourse is putting your name watermarked real big in the middle of the image or make it so low res no one can use it for anything. Of course we should always see the positive. Digital art has avenues for distribution like never before. You can create an image and possibly attract an opportunity to make more images for money. It still costs money to make money, so the web should be this great opportunity. Unfortunately a free-for-all on your stuff is the consequence for an audience. ML: What programs do you use for creating your art? SN: For basic illustration: Photoshop. T-shirts: Illustrator. 3-D animation: Cinema 4D. 3-D game engine: Unity. ML: What’s your long-term future plan? ML: How will games look like in the future? SN: I think games might be us just sitting down on a couch and closing our eyes. I see us having devices permanently attached to us that connects us to some hyper web that stream us game play. I don’t think the game genres will change. They never really do — they stay the same while processing power increase. ML: Are you related to Chuck Norris? SN: No, but I did love that dude when I was a kid. I had all his posters for his cheesy movies in my room and I swung around nunchucks and had a ninja sword. He actually had a cartoon I used to watch all the time. Now I guess his politics don’t mesh so much with mine. His cartoons were the only thing in my childhood I’m still attached to, which is probably good. ML: Gotta tell you about the first time I saw your work. It was at Jay’s Cheesesteak, on a date with a Serbian guy from the Mission. Slow dinner because I was trying to keep my sandwich intact. We got into talking about your mural. He said you had other murals around. Sometime later when our dates became days he took me to see some of these. And I liked how he felt close to his neighborhood like some people fall in love with Paris and write songs about it. We broke up, got back together, broke up then got married and had a baby. It’s been an honor to interview with you. SN: It’s an honor to be part of the inception of your relationship. Mural watching is such a good move for guys. They should put that in some SF first date guide book. 1406 B Valencia Street @ 25th St.
Art supplies included with the cost of class. To sign up, email cartoonliteralism@gmail.com with name of student, name of parent or guardian, age of student and phone number.